The Dahle 534 guillotine paper trimmer is a great choice for photographers and anyone else who needs an easy to use, high quality paper cutter. Watch this review to see the pros and cons of this model and purchase it at the link below. Keep shooting! Hey Everyone, my name is Greg Cazillo from cazillo.com and I am reviewing the Dahle model 534 guillotine cutter. I recently moved into a new photo studio, so I needed a new paper trimmer. Dahle, who has been in business since 1930, is one of the most popular brands of cutters so I went on their website an looked through their wide selection. They have many sizes and types of cutters and trimmers. The most popular trimmer is a rolling trimmer which has cut lengths up to 72". The hardest part is choosing which type and model to purchase. I bought a guillotine trimmer since I am used to them and I knew it would not slow down my workflow. Many times I need to cut out wallet size prints or baseball trading cards which take a while when you have 50 or more to do in a sitting. A guillotine trimmer is a good balance of accuracy and cut quality. I can easily trim a very thin portion of a print for the perfect cut. The Dahle 534 Guillotine Trimmer has a metal base with plastic guides on the top and bottom of the field. Also on the field are guides for standard paper sizes like letter, legal, and other standards like A4, A5, A6 and business cards. Also on the top at bottom there are rulers in both inches and millimeters. The trimmer comes with a protective guard which doubles as a clamp. The blade is self-sharpening, made of German Solingen steel, allowing a cutting capacity of up to 15 sheets. The blade is also adjustable and will stay in the upright position with a set of springs. Lastly the trimmer comes with an adjustable guide so you can more quickly reproduce your cuts. You can cut photographic paper, card stock, illustration paper and foam core with this trimmer. Although this is not recommended, I removed the guard. Do this at your own risk. The blade is very sharp and can very easily cut you or worse. The reason I removed the guard is because I find it much quicker to cut photos. Without the guard in place I can line up a photo for printing on the blade side which is much faster and more accurate. When lining up a photo to cut, say an 8x10 print on an 8 1/2 x 11 paper, the ruler is almost useless on the first and second cuts. As you can see the extra paper covers the ruler. Once you have the first two cuts completed, you can use the ruler for the third and fourth cuts. The same goes for cutting multiple photos from a single sheet. It would be great to have the ruler extended vertically onto the paper guide so you can see the marks even if the paper is covering it. I will probably end up drawing lines on the guide to fix this issue and to make it easier to use. I absolutely love how the blade will stay upright at any position which is a great feature. The old one I used for years didn't do this, so you would have to hold it or move it to 90 degree position so it would stay in place. There is a drawback of this feature, which is when you raise the blade it can also lift the metal base. I contacted Dahle and they sent me instructions on how to adjust the blade, although if you loosen it too much it could affect the quality of the cut. Another workaround is to remove the rubber feet and bolt it to a table or find a method to clamp it to a table. I will probably do the latter because I like the precision cut. Here is a bonus tip for you, when cutting prints larger than the default cut length you can stop your cut before the blade goes all the way down, then move the paper up, lining up the first cut with the blade. I've had very good luck with this method and use it on a regular basis, or at least until I purchase a larger trimmer. I purchased this one from Amazon for $125 which is a great price for such a high quality trimmer. Beware of any sub-$100 cutters, they are very low quality and will either give you a bad cut or slow down your workflow. As mentioned the trimmer should have the ruler marks extended vertically, and the base rises when you lift the blade. The pluses of this trimmer outweigh the minuses, but I have easy workarounds for both issues. 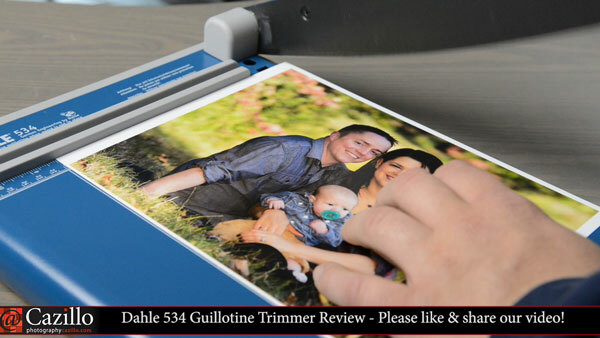 If you can only purchase one trimmer, consider the Dahle 534 Guillotine trimmer as I highly recommend it. You can purchase a Dahle 534 Trimmer at this link. Thanks everyone, keep shooting!